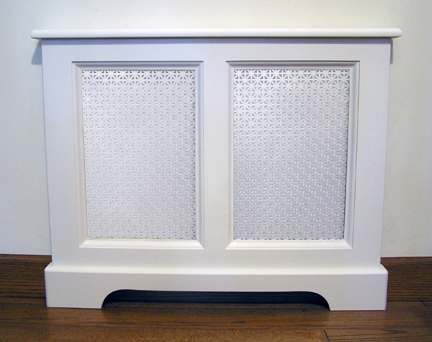 Our custom furniture quality painted wood radiator covers are available in various styles (Washington Elite with cloverleaf brass grille shown above), paint and grille colors. See specifications below. If there is something else in particular you have in mind, email us a photo and we can give you a quote. 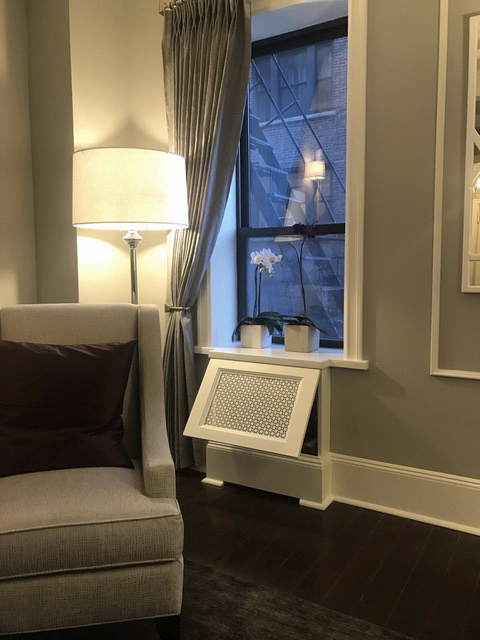 Pictured above is a radiator cover that a client requested with a hinged panel so that they would have easy access to the radiator. 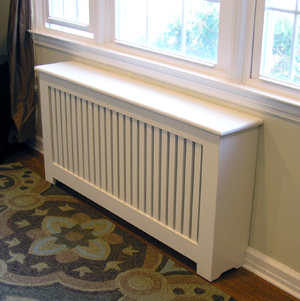 Use our Radiator Cover Measuring Instructions to enter the size of your radiator on our worksheet and email it to us. 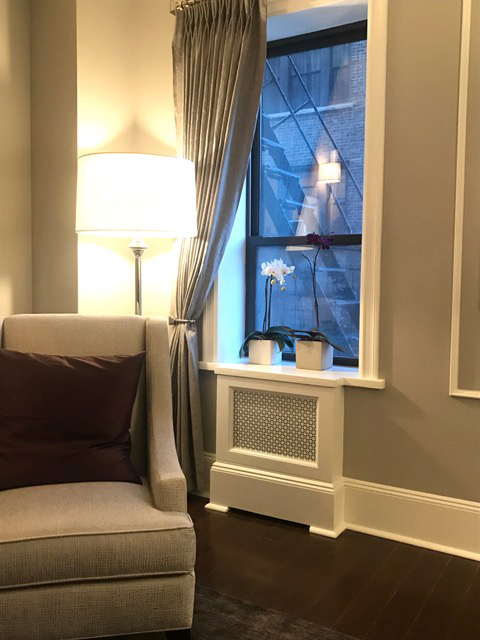 We will get back to you with a drawing of the finished outer dimensions of the radiator cover and an estimate. Payments are made through PayPal. 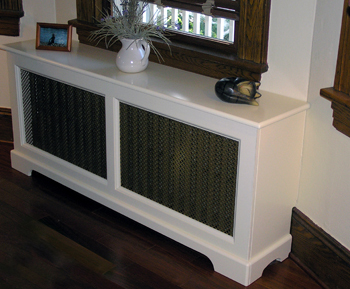 Once notification is received of your payment we will then begin work on your custom radiator cover. Allow approximately 10-14 business days for completion. Solid wood front, mdf sides and top. 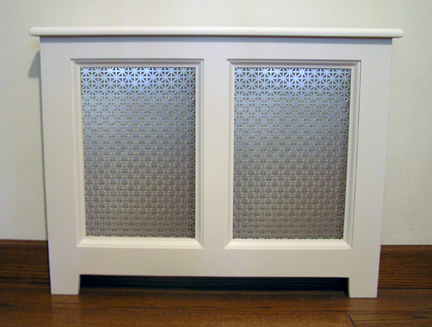 Round over edge on top, molded ogee edge where wood meets metal grille (unionjack silver shown). Slight taper on leg. Top overhangs back 1" to allow for your house baseboard. Or sides can be notched out for baseboard. Floor levelers included. Prices are for finished outside dimension of cover. 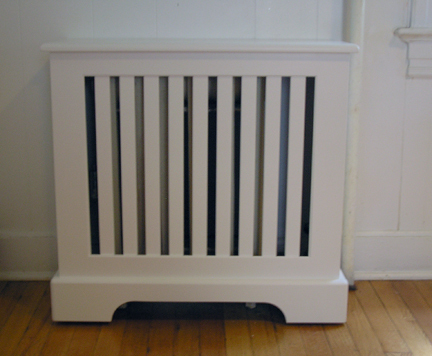 All prices include primed in white, and top coated in satin white paint. If you prefer to topcoat yourself deduct 5%. Primer used is excellent for waterbase and oil based enamels. Benjamin Moore Satin impervo interior waterbase paint available in any color you choose. Plus $35 any size cover for all models listed. Solid wood front, mdf sides, top and foot board. Round over edge on top, molded ogee edge where wood meets metal grille (unionjack white shown). Round over edge on foot board top edge and on corners. Top overhangs back 1" to allow for your house baseboard. Or sides can be notched out for baseboard. Floor levelers included. Prices are for finished outside dimension of cover. 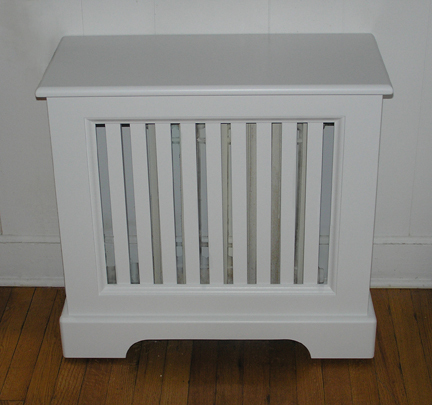 All prices include primed in white with white satin top coat. If you prefer to topcoat yourself deduct 5%. Primer used is excellent for waterbase and oil base enamels. 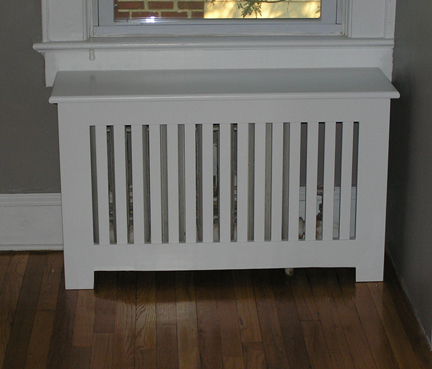 Solid wood front,solid wood slats, mdf sides and top, Round over on top edge, top overhangs 1" to allow for your house baseboard. Or sides can be notched out for baseboard. Floor levelers included. Prices are for finished outside dimension of cover. All prices include primed in white with white satin top coat. If you prefer to top coat yourself deduct 5%. Primer used is excellent for waterbase and oil based enamels. Solid wood front, solid wood slats, mdf sides, top and foot board. Round over edge on top. Round over edge on foot board edge and corners. Top overhangs 1" to allow for household baseboard. 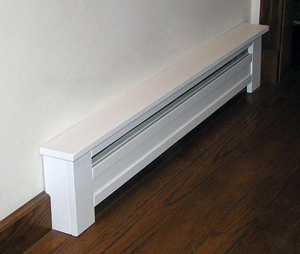 Or sides can be notched out for baseboard. Floor levelers included. Prices are for finished outside dimension of cover. All prices include white primer with white satin top coat. If you prefer to top coat yourself deduct 5%. Primer used is excellent for waterbase and oil based enamels. Same as Madison Mission except it has molded ogee edge where front meets slats. Prices are for finished outside dimension of cover.